Shion, at first acted very selfishly towards everyone, believing that she was more important than anyone (As shown by her lack of care for everyone around her, even her dedicated followers). This was shown in the first comment she made, casually dismissing the fact that many people died for her, by saying that their wish was to leave her unharmed. She also acted rather snobbishly, complaining about the smallest of things. An example is, when they had to move around a steep mountain, complaining how uncomfortable Sakura's back was when they were being acted. She had a rather evil sense of humor, by teasing Naruto, who was scared by her vision, that he would be killed by being beheaded. 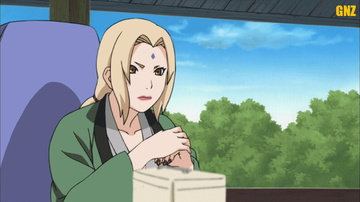 Naruto later uncovers the reasons behind her attitude, due to people fearing an appearance in one of her predictions, they would avoid her effectively isolating her like Naruto. Since he himself went through the loneliness and pain of being an outcast from society, he was able to empathize with her. Shion is shown to truly be a kind girl bound by her duty, and her guilt because of her Future Telling. She feels that if she shows emotions, that she would be insulting all those who died for her, resulting in her attitude. After her adventure with Naruto, she changed for the better, becoming more open and kind, and even developing romantic feelings for him. Her love for Naruto went so far, that she asked him to stay with her and be the father of her child.